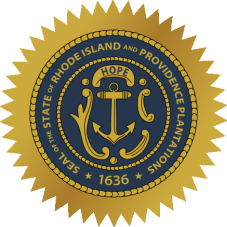 Rhode Island vital records can be obtained from the Office of Vital Records in the Department of Health in the case of Rhode Island marriage records, which cost $20, and from the Clerk of Family Court for $3 when seeking Rhode Island divorce records. However, only those with a "direct and tangible interest" in any records may access them. Counties and cities store their own records of civil unions, marriages, and divorces that occur in their jurisdiction and may have different methods for requesting these files. Rhode Island marriage records older than 100 years are considered public records and may be obtained from either the relevant county or city or from the Rhode Island State Archives. Rhode Island is the smallest state in the country by area but holds two seats in the House of Representatives, more than the much larger states of Montana and Wyoming. Note: The record may be also obtained from the town or city where the marriage took place, if the record is less than 100 years old. Record Access Requirements: Requester must be person of record or immediate family members. Note: Divorce records are found at one of the 5 county Family Courts. Note: For questions regarding the Superior Courts, call 401-222-2622. For questions regarding the District Courts, call 401-458-5201. Record Access Requirements: Criminal records are only released to law enforcement agencies, the subject, or to those with a signed notarized authorization from the subject. Search Note: They will call the Notary on the authorization for verification. 100% of the records are fingerprint-supported. Search Note: Location, physical identifiers, conviction and sentencing information, and release dates are provided.